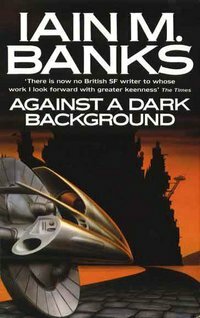 Banks manages to create a space opera without having much space travel in this grim tale. It's the sort of thing that my brain says shouldn't work and yet it very obviously does. The story weaves action and adventure together with dark personal history and familial politics to create a lush web. Sharrow, our main character on this strange ride, is fleshed out in painstaking detail through the novel. Her past informs her present and Banks delivers bits and pieces of her history carefully, doling them out like rewards. At times the information is a little too perfectly placed: finding out something crucial JUST BEFORE it becomes important and that can telegraph a punch, but for the most part Banks balances the entire affair well. Sharrow's partners are also well drawn, giving Banks a deep well of character to pull from both for history building moments and current interactions. Together he delivers a team that finds itself hunting artifacts so that Sharrow herself can survive. Sometimes it is that simple. It's the sort of deceptively simple plot that a good writer can work wonders with, because they aren't weighed down by the constant machinations of needing to twist and turn, so they can create and fill-in the world they play with. It's what Banks manages to do here. Because really that's all the plot is: Sharrow and her team need to find an artifact before a religious group kills her. Clean and simple and, thankfully, it turns out to be anything but clean and simple in execution. The complexity all arrives from what feel like natural happenstance, and that saves this novel as things progress. Because sometimes, let's face it, everyone runs into the D&D plot syndrome. Everyone meets in a bar and has to go complete a mission and... yeah. Banks avoids it all with a deft flair. His sense of humor also lets the reader breathe, which is crucial in this one, as the story itself is dark. The title is more than a nice phrase it is something of a warning. A very dark background indeed. Still, the book is far from perfect. At times the world building can feel oppressive as Banks has a lot of information to impart here. Also, frankly, Sharrow and company, oddly enough, can feel almost too close to one another despite how well drawn they are. It's frustrating.